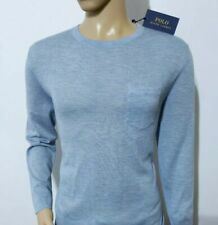 Men's Ralph Lauren 100% Wool V Neck Pull Over Jumper. If you have any questions please don't hesitate to contact me. Grab a bargain!!! 27" FROM BOTTOM OF THE COLLAR, TO THE HEM. 21" FROM ARMPIT TO ARMPIT. Ralph lauren mens cardigan soft green merino wool with burgundy logo and two front pockets. A size medium in very good condition it comes from a smoke and pet free home. UK post only. Genuine Jumper by Ralph Lauren. UK Size XL. S m a r t a n d tidy t h i n k n i t h a l f zip c o t t o n s w e a t e r i n m e d i u m t o d a r k b r o w n. Dark R e d p o n y logo t o c h e s t. B r a n d new a n d t a g g e d.
The jumper was a size large which has shrunk and now fits more like size small. The jumper is in good condition with a bit of lint only as can be seen from the photos. Collar Style: Polo Neck. Material: Wool. Material: 100% Lambswool. Featuring ribbed cuffs and hem. Mens Ralph Lauren Maroon Jumper - L Large. 100% Lambswool. Rare. See All Ralph Lauren Here. Length: 24". The length of upperwear is from the nape of the neck to the bottom of the hem. See All Sweatshirts Here. Designer Knitwear. Traditional Knitwear. Lacoste & Ralph Lauren. Chest Size 32" (82 cm). Length from nape of neck excluding collar to hem 23” (59 cm). The chest is approx. 32" (82 cm), pit to pit 16" (40 cm), length 23" (59 cm) from nape of neck to hem. Genuine, with Supplier code on label. Lacoste & Ralph Lauren. Underarm pit to underarm pit 17” (43 cm). Arm length pit to cuff 15" (38 cm). The chest is approx. 34" (87 cm), pit to pit 17" (43 cm), length 21" (54 cm) from nape of neck to hem. MENS RALPH LAUREN BLACK V NECK LONG SLEEVE LAMBSWOOL JUMPER L 42-44"
CHEST 34 36 38 42 44 48 50 54. WAIST 28 30 32 34 36 38 40 42. LENGTH (SHOULDER TO HEM) 25". Mens RALPH LAUREN POLO lambs wool 1/4 Zip Jumper/Sweater size XL. RRP £165. An elegant black 1/4 zip jumper in 100% lambs wool with a very soft feel and the iconic POLO pony to the chest in red. 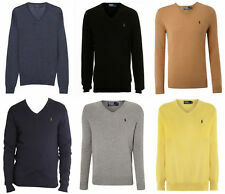 A chic stylish top quality 1/4 zip sweater from RALPH LAUREN POLO just exuding luxury. Men's Ralph Lauren Polo Crew Neck Green Lambswool Sz Medium Authentic Dark Green Condition: Used in very good condition. Small defect on v-neck stitching. 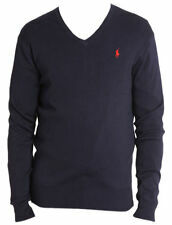 Stunning, Lightweight Crew Neck Purple Label Jumper From Ralph Lauren. Long Sleeved Thinly Knitted Crew Neck Jumper / Sweater. Colour: Bright Pink. Size: Small. Dry Clean Only. Also Features Ribbed Hem And Ribbed Cuffs. Ralph Lauren 2XL V Neck Beige Men’s Jumper . Condition is Used. Dispatched with Royal Mail 2nd Class. MENS RALPH LAUREN RED 1/4 BUTTON NECK LONG SLEEVE LAMBSWOOL JUMPER XL 44"
CHEST 34 36 38 42 44 48 50 54. LABEL SIZE XS S M L XL XXL 3XL 4XL. WAIST 28 30 32 34 36 38 40 42. 100% Lambswool. Length: 28". Pit to pit: 26". Sleeve: 26". ORIGINAL RRP £165.00. GREEN POLO PONY EMBROIDERY LOGO ON CHEST. PIT TO WRIST 21". SHOULDER WIDTH 18". Jumper Can Also Be Dry-Cleaned. Size: IT 54 / XL. A lightweight jumper fromRalph Lauren Polo. Designer Knitwear. Traditional Knitwear. Lacoste & Ralph Lauren. Chest Size 36" (92 cm). Length from nape of neck excluding collar to hem 22” (56 cm). The chest is approx. 36" (92 cm), pit to pit 18" (46 cm), length 22" (56 cm) from nape of neck to hem. Excellent Polo by Ralph Lauren, unwanted gift nearly new. Size medium. Pure new wool soft fabric with banded cuffs and waistband. Here at Quality Clobber we’re passionate about fashion. ORIGINAL RRP £145.00. RED POLO PONY EMBROIDERY LOGO ON CHEST. SHOULDER WIDTH 19.5". FULL LENGTH 28". Full-zip front with a signature suede pull. Regular Fit. Faux-suede piping at the interior back of the neck. Two front waist angled pockets.